Jeffrey Aolysius Van Note was born February 7, 1946 in South Orange, to Marie and Peter Van Note. The family lived in Hackensack until Jeff was two, when his father moved to Louisville, Kentucky. Peter opened a successful aluminum tray business, but the happiness that brought was shattered in 1956, when Jeff’s mother died from cancer. Jeff filled the void by playing football. As a teenager, Jeff was sent to St. Joseph Prep, a boarding school in Bardstown about an hour from home. It was during this period when he met his future wife, Dee. They would marry and produce three children. He played running back and linebacker and did well enough to earn the last available scholarship from the University of Kentucky in 1965. In three varsity seasons he saw action on both sides of the football, but distinguished himself as a linebacker. 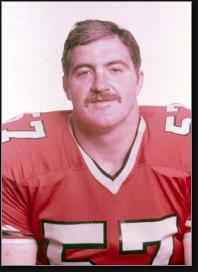 The Atlanta Falcons drafted Jeff in the 11th round in 1969. He came to camp as a middle linebacker challenging Tommy Nobis for playing time. After failing to impress at this position, the team waived him, and he ended up playing most of the year for the minor-league Huntsville Hawks. But coach Norm Van Brocklin—who shared Jeff’s Dutch heritage—reclaimed him and moved him to the offensive line, where he saw action in one game in ’69 for the Falcons. He became the starting center at the beginning of the 1970 season. Jeff weighed 235 as a rookie but eventually bulked up to over 270 pounds. Despite playing for a number of poor teams—and competing in an era of top-notch centers—he made the Pro Bowl six times between 1974 and 1982. Atlanta’s 1980 club was the best during Jeff’s career. The Falcons went 12–4 and had the talent to win a title. They blew a 10-point lead against the Cowboys in the playoffs. Jeff became involved with the Players Union in the 1970s. He served as VP from 1979 to 1982 and as President in 1983 and 1984. Jeff held on to his starting job until 1986, when at age 40 he played in his 246th game—second-most to Jim Marshall for most games played with one NFL club. Jeff retired after the season. The team retired his jersey #57 at halftime of the final home game in 1986. In 1991, Atlanta fans voted him the franchise’s all-time favorite player. In 1999, he was inducted into the Georgia Sports Hall of Fame. During the 1990s, he had his own sports talk radio show, and often did TV work for his alma mater and the Falcons. He also worked Tennessee Titans games in 1997. In 2004, he became the main color man for Georgia Tech broadcasts. He also did a Falcons pre-game show on Sundays. In 2006, Jeff joined Tommy Nobis, Steve Bartkowski, William Andrews, and Jessie Tuggle in the team’s Ring of Honor.